Developing the embouchure to produce high pitches on the French horn will require a daily practice routine and dedication to playing. The horn is a difficult instrument that requires the player to have great familiarity and to develop comfort with the highest range of the instrument. Increasing your high range will improve your overall tone production. Learn to use proper breath support. Without proper breathing, you will not have the support necessary to play the highest pitches on the French horn. Use your diaphragm to support your airflow and bring in the necessary amount of air into your lungs. When breathing, imagine you are yawning and feel your sides and stomach expand with air. At first, this will be uncomfortable to play using this much air, but it is crucial to having a solid high range on the French horn. A strong embouchure is necessary to improve your high notes. Pretend like you are breathing through a straw and notice the muscles that are used to create the suction. These muscles must be strengthened to ensure that your lips can be strengthened to play the highest notes effectively. 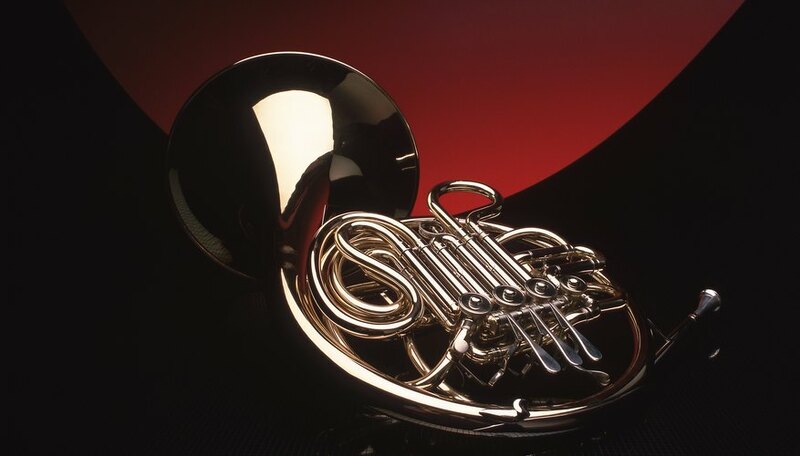 To strengthen the embouchure, play long tones in the high, middle and low range of the French horn. Practice these exercises for at least 15 to 20 minutes each day to improve your range and ability to sustain high notes. Take a pencil and hold it between your lips. Attempt to make the pencil horizontal to the ground for as long as possible. This exercise will work the muscles of your embouchure and help you to develop a strong high range capable of sustaining notes for a long period of time. This exercise has the added benefit of making it possible for you to practice away from your horn. You can also practice this exercise without the pencil, but the pencil helps to concentrate your muscles on a physical object. More than any other exercise, a daily routine where you practice major and minor scales, arpeggios and etudes will help to increase and make the highest notes more powerful. Beginners should practice for at least 30 minutes per day and gradually increase the time to 60 minutes or more per day. Consistent practice will keep the muscles in your embouchure strong and will increase your flexibility and ability to play high notes.